In the beating heart of Barcelona, ? ?among the jewels of the architecture of Gaudi and the Gothic Quarter of the Old City neighborhood, this elegant and quiet apartment recently renovated with an original combination blend of traditional and contemporary design. Industrial materials like iron, cement, glass and plaster are mixed with the original pavement and in vitro ceramic windows. This fantastic apartment has a large bedroom with double bed, ceiling fan, couch (can also be a guest bed for more) and a large closet. The kitchen is fully equipped with new appliances: oven, fridge with freezer, dishwasher, design utensils (plates, cups, glasses) and Nespresso machine. It has two bathrooms, one shower and one small but very comfortable, decorated in plaster and glass and with a very large shower that can fit in more than two ... one of the most interesting areas of the building. Also there: sheets, towels, Wi-Fi, washing machine, hair dryer, TV and iron. The living room is large and bright, with a comfortable sofa (that turns into bed for two guests) and two tables, one with chairs and one with high legs. 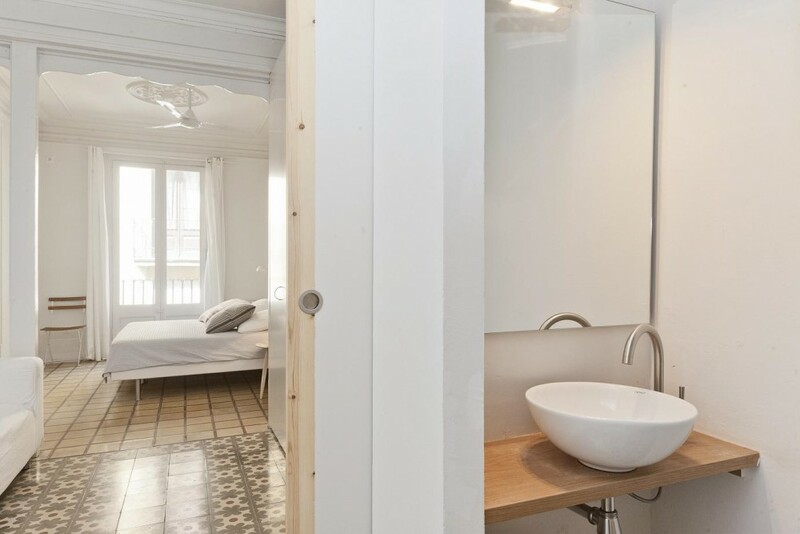 An apartment for four or five people who can live in a relaxing and cozy finely restored for breakfast or dinner a few meters away from Plaza Catalunya and the most frequented streets of Europe, Angel Street and Calle Portal of Portaferrissa among the best places for shopping in Barcelona.